Posted on 12, July 2016 by EuropaWire PR Editors | This entry was posted in Construction, Norway, Real Estate and tagged contractor, Doyén Drammen, ev Wedels plass AS, residential project, Strøm Gundersen AS. Bookmark the permalink. 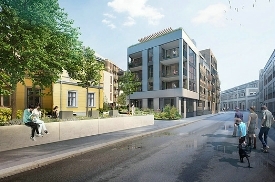 OSLO, 12-Jul-2016 — /EuropaWire/ — Strøm Gundersen AS, in which AF Gruppen is the principal shareholder, has been selected by Grev Wedels plass AS as contractor to build the Doyén Drammen residential project at Grev Wedels plass in Drammen city centre. Grev Wedels plass AS is owned by Oxer Eiendom and Glitre Eiendom. The contract is for building a total of 82 apartments with a parking basement. The flats, which vary from 50 to 157 square metres in size, will include lift, balcony and 500 square metres of common areas that include a gym and spa. The contract is a design and build contract valued at NOK 222 million, excluding VAT. Work is expected to start in October 2016, and completion is scheduled for Q4 2018.